Move outta your lane... I'm coming through! hahahaha Cars, cars, and more cars, peeps! 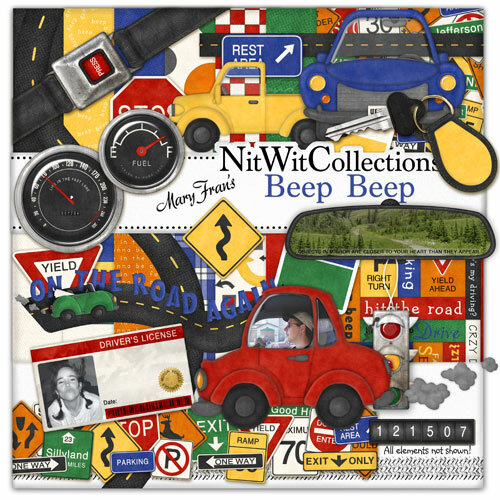 My "Beep Beep" is running on high octane... there's speedometers, gas gauges, and even a "dateometer" that you can insert the date of your photos in! Yup, this one was a real toot (get it?) to make! Perfect for all them masculine pages.... whether it be human or, in my case, dawg! hahahaha Hope this one gets ya in gear and starts your (creative) engines! Some elements include shadowing for realism as well as to preserve the "see through" look of the windshields!